For us in the United States, and everyone around the world that uses the Julian/Gregorian Calendar, today is New Year’s Eve and tomorrow is New Year’s Day. On the liturgical calendars (like the one used in the LCMS) the New Year started with the First Sunday in Advent, so the New Year is well underway. Still, there is a holiday to celebrate tomorrow, the Circumcision and Name of Jesus. In Jewish homes, in Jesus’ day, children were (and still are I assume in Jewish households) circumcised on the eighth day and given their name. So our Lord Jesus was circumcised and given his name on January 1 (though of course they didn’t call it January 1). In this act of circumcising and naming, Jesus’ destiny of atonement was already revealed. At that moment, His blood is first shed and Jesus receives the name given to Him by the angel “You shall call His name Jesus, for He will save His people from their sins” (Matthew 1:21). 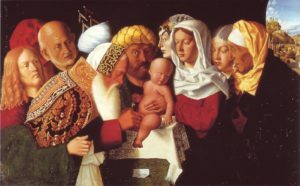 In the circumcision of Jesus, all people are circumcised once and for all, because He represents all humanity. In the Old Testament, for the believers who looked to God’s promise to be fulfilled in the Messiah, the benefits of circumcision included the forgiveness of sins, justification, and incorporation into the people of God. In the New Testament, St. Paul speaks of its counterpart, Holy Baptism, as a “circumcision made without hands” and as “the circumcision of Christ” (Colossians 2:11). So we can celebrate today/tomorrow. We celebrate that Jesus is our redeemer who bought us with his shed blood.